In children, too little vitamin D has been associated with bone softness and an increased risk of heart disease later in life, among other health problems. (Health.com) -- The vast majority of infants in the U.S. are not getting the vitamin D that they need, even if they are fed vitamin-enriched formula, a new study has found. Roughly 9 out of 10 breast-fed babies receive less vitamin D than experts recommend, according to the study, which was conducted by researchers at the U.S. Centers for Disease Control and Prevention. Among formula-fed babies, fewer than 37 percent consume the recommended amount. It is well-known that breast-fed infants are at risk for vitamin D deficiency. But the study findings suggest that most babies will require a supplement regardless of how they're fed. "We have to educate moms and the health-care community that vitamin D supplementation is something that they should do [and] recommend," says the lead author of the study, Cria Perrine, Ph.D., of the CDC's division of nutrition, physical activity, and obesity. The study, published this week in the journal Pediatrics, comes amid growing awareness of the extent - and the health risks - of vitamin D deficiency in both children and adults. Known as the sunshine vitamin, because the human body produces it when exposed to sunlight, vitamin D is essential for healthy bones, a strong immune system, and a range of other bodily processes. In children, too little vitamin D has been associated with bone softness and an increased risk of heart disease later in life, among other health problems. In 2008, the nation's leading organization of pediatricians, the American Academy of Pediatrics, doubled its recommendation for the amount of vitamin D that infants and children should consume daily, from 200 to 400 international units. "Most infants will require a vitamin D supplement to reach the new AAP recommendations, while in the past we only thought that breast-fed infants would need supplementation," says Perrine. "Formula-fed infants would need to consume a liter of formula a day to meet the new recommendations, and most infants don't do that - especially those who are being fed with both formula and breast milk." Perrine and her colleagues reviewed data from a national study that monitored what new mothers fed their babies between 2005 and 2007. 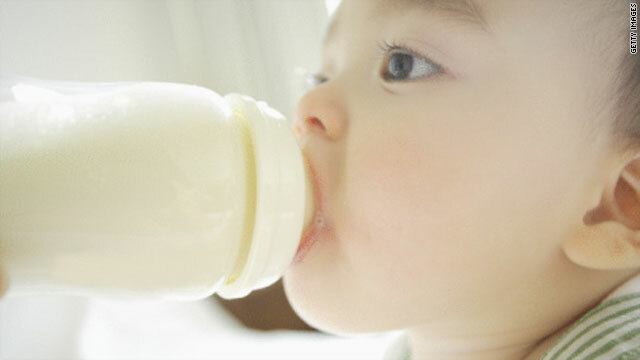 The study, known as the Infant Feeding Practices Study II, included more than 1,500 infants ages 1 to 10.5 months who were fed only breast milk, only formula, or a combination of the two. By analyzing the infants' diet and whether they were receiving a vitamin D supplement, the researchers estimated what percentage of infants met the then-current AAP guidelines of 200 IU of vitamin D per day, as well as what percentage would have met the new intake guidelines released in 2008. Very few infants who consumed breast milk alone - between 5 percent and 13 percent - met the current or former recommendation for vitamin D intake. Among the formula-fed infants, 81 percent to 98 percent met the former recommendation, but just 20 percent to 37 percent of the same infants would have met the current recommendation. Most babies did not receive vitamin D supplements. No more than 13 percent of the breast-fed infants were given supplements, and fewer than 4 percent of the formula-fed babies received them. The results - especially concerning formula-fed babies- are eye-opening, says Carrie Drazba, M.D., a pediatrician at Rush University Medical Center, in Chicago. "I don't think a lot of us realized that formula-fed babies are not meeting their vitamin D requirements," she says. Although the most obvious health problem associated with vitamin D deficiency in babies is rickets, or soft bones, pediatricians are increasingly mindful of respiratory infections and chronic diseases (such as type 1 diabetes) that have been linked to inadequate intake of the vitamin in that age group, Drazba says. A pair of studies published last year, for instance, found that children with low levels of vitamin D were more likely to have several risk factors that contribute to heart disease, including high blood pressure, high blood glucose, and low HDL (or good cholesterol). "We're finding out that there are other risks associated with vitamin D deficiency besides rickets," says Drazba. "A lot of cells in our body have receptors for vitamin D."
A second study, also published in Pediatrics this week, provides a snapshot of vitamin D deficiency among infants and their mothers in Boston during the same time period, 2005 to 2007. Fifty-eight percent of newborns and 36 percent of mothers were vitamin D deficient, the study found; the deficiency was deemed "severe" in 38 percent and 23 percent of the babies and moms, respectively. The new studies underscore that vitamin D deficiency is an issue that mothers and doctors need to address from birth through childhood and beyond, Drazba says. "We're realizing that with the combination of more women breast-feeding and how we slather kids with sunscreen and don't let them run in the sun anymore, [kids] aren't getting the vitamin D exposure that they used to, or that they need," she says. Vitamin D deficiency is a concern in adulthood as well. By some estimates, more than half of adults in the U.S. don't get enough vitamin D from sunlight or from fortified foods such as milk, the other main source of the vitamin. And in recent years studies have linked vitamin D deficiency in adults to a long list of serious health conditions, including heart disease, certain cancers, osteoporosis, diabetes, Alzheimer's disease, schizophrenia, depression, and some autoimmune disorders. In response, the Institute of Medicine, an independent nonprofit organization that advises the U.S. government on health and medical matters, is now considering whether to raise its guidelines for vitamin D intake for adults and children of all ages. The institute is expected to announce its decision by the end of the summer.